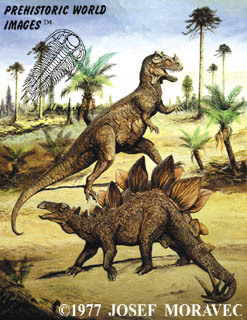 Within the print, the features of the stegosaurus are prominently displayed, from the sizable plates upon its back, to the prominent spikes on the end of its tail. It is speculated by archaeologists that that these plates were used to help control body temperature, though they could have been involved in defense or mating display. The Stegosaurus was a plant eating dinosaur, and a large one; they were about 30 ft long and up to 9 feet long, weighing in at approximately 4,000 pounds. It has long been thought, due to the very small head of this animal that it was not exceptionally intelligent. The Ceratosaurus was a theropod, belonging to the same group as the later Tyrannosaurus Rex and its contemporary, the Allosaurus, another meat-eating theropod dinosaur. They probably hunted in groups, and likely were scavengers as well. Imagine the terror of being surrounded by a group of these predacious creatures! They are estimated to have measured 20 feet from its head to the tip of its tail and weighed up to 2,000 pounds, with the males thought to be larger than the females. It is noted for having a pair of bony ridges above its eyes and a horn on its nose. They had massive heads with large sharp teeth and likely very good eyesight like most predators, and considerable intelligence. Its legs and tail were massive and muscular. Easily seen in the print are the small arms, ending in the very well defined claws that its species is known for. Overall, this quality art print is a magnificent piece of art displaying two of the most impressive dinosaur species to have existed during the Jurassic Period. The stunning detail of the dinosaurs and the simple, yet beautiful, display of their surrounding environment gives a great view of these beasts who ruled the earth in its antiquity. This work is sure to please anyone who appreciates dinosaurs, and anything prehistoric, and would make a wonderful addition to any collection of art relating to that period of time. Josef Moravec, is a renowned paleo-artist, whose works have been featured in Natural History Museums throughout North America and Europe. His works are known for their accuracy and attention to detail. What child or adult dinosaur enthusiast wouldn’t love to have this print displayed in their room or study?